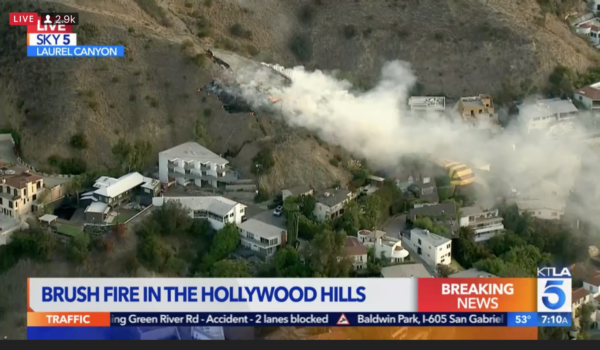 Firefighters raced to douse a brush fire in the Hollywood Hills just above Sunset Blvd in Laurel Canyon early Friday morning—the area made famous by such 1960s singers as Joni Mitchell. The streets are narrow, making it difficult for fire trucks to reach the outbreak. But the Santa Ana winds that have driven so many of the other fires this past week were not a factor and between water-dropping helicopters and aggressive LA County firefighters, the brush fire was contained around 7:30AM. Fear of the brush fire spreading initially had Mt. Olympus/West Hollywood residents holding their breath, a natural reaction as the state watched in horror as so many other areas quickly fell to fire this past week. The death toll in California’s most devastating wildfires in history climbed to 63 on Thursday, while the number of missing is now 631, authorities told the Los Angles Times. Donald Trump is expected to tour some of the burned out areas on Saturday.